It's nice to see the girls get it done in the Olympics. In the meantime the USMNT does their job in Guatemala amidst ridiculous claims that Lewis' facial gash was unintentional when the replay clearly shows the Guatemalan extending his elbow maliciously. To each his own, I guess. And what about the MLS? In the meantime life rolls along and numbers remain average at best (~75% for the most part. Becks and the Galaxians "visited" the Goats and once again sold out the HDC. Chicago continues their run of good form with another near-capacity showing thanks in part to Blanco. McBride should technically keep a good chunk of the crowd coming once Cuau leaves for his homeland (they sorely miss him... just look at WCQ highlights of Wednesday's match against Honduras). As I had promised previously and keeping with the attendance median theme, I decided to calculate medians for the relative attendance. So, instead of just showing what the median attendance is for each team (which effectively negates the Beckham factor for the other 13 teams in the league), we can now see just how full a stadium is during most of the matches. I'm including two additional plots here, one for the East and one for the West. 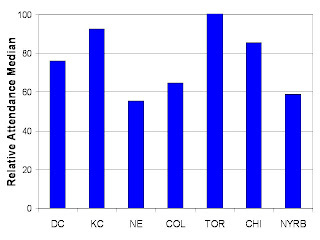 Back east New England and Columbus are isolated with low attendances. Notice that New Englands relative attendance average is much higher due to the Brazil doubleheader. DC's numbers are also brought down a bit and from my "star power" analysis Gallardo doesn't seem to be drawing that many fans. New York remains below average even after the Becks crowd, and after last weekend's 11K+ crowd things aren't looking that much better. Also note that KC's numbers are bolstered by their smaller stadium. The West has the same stories with interesting caveats: RSL's numbers used to be among the best in the league and their lack of form, until just the past couple of months, has taking its toll on numbers. Maybe the new stadium will bring new and old fans alike. Chivas is also showing why its critics are being so harsh and are calling for rebranding and relocation. 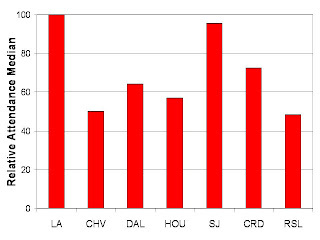 FCD hasn't been notoriously good in terms of attendance and this analysis also touches on that. Finally, Houston's numbers are low mainly due to its capacity (27K) but generally enjoys crowds that would readily fill 80-90% of smaller SS stadiums. OK, enough with the Olympics and the latest Olympic failure. Back to MLS. It was a slow weekend all around as the total attendance stats show. Attendance was average even in relative terms (~75% for the east and ~65% for the west). Keep in mind that there was no Beckham circus this past week and that a good amount of players were missing due to Olympic call-ups. 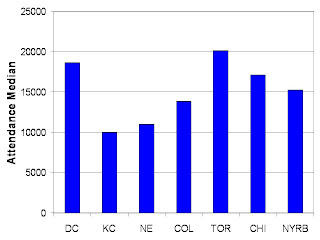 Most notable was the low attendance for the Colorado-TFC game although it should not come as a surprise. Pleasant surprises were the numbers at New England (19K+) and New York (15K+), with an exclamation point on New York since the fans saw their team win decisively. You'll note that I have eliminated a couple of the ads on the right column and permanently added medians to the list. 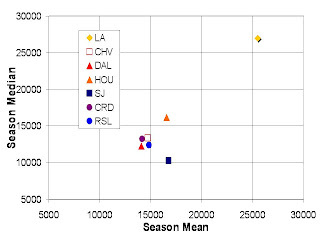 From several threads on BigSoccer.com, it became evident that an important way to show MLS attendance trends minus Becks was to take out the outliers that changed the means and relative attendance for teams like San Jose, DC, and New York. 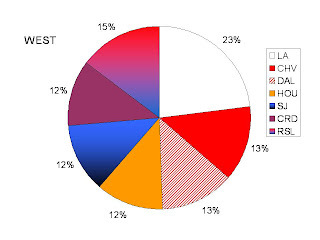 Additionally, I thought it would be nice to look at the percentage of the total numbers that each team accounts for in a pie chart, this time for the western conference. You'll note that teams match up pretty evenly throughout and this also compares to the numbers seen in the average and median attendance plots. LA leads, of course. Mistakes that cost us a trip to the history books: needles fouls, two at the end of the game versus Holland (one by Bradley to see him miss tonight's fateful game and one by Holden that set up the tying free kick), then another one by Orozco in the beginning of tonight's game that saw a red and left team USA with 10 men and zero options. Missing Adu also hurt since Kljestan was lonely in the midfield and Feilhaber was useless when he stepped in for Altidore (?). It is clear to me now that Adu and Bradley are important pieces of the American puzzle for our future outlooks, that more discipline on the pitch is needed, and that our over 23 players like Donovan, Beasley, Bocanegra, Onyewu, Dempsey and even Eddie Johnson still have a job and for pete's sake... give us something to be proud of in the qualifiers! So last night I went to be before 10, did not sleep well and woke up around 3:30, saw a terrible game until Nigeria scored its second goal and then went back to bed. Much better now physically but hurt mentally just like Jamie Trecker's rants and Steve Goff's subtle report on the game. We, as I stated in the last post, had our hands on history and all we needed was a measly tie. It slipped away from us like the Titan's last play in the 2000 SuperBowl or the Cubbies' fateful ball [that Alou could have caught] in 2003 in the Bartman incident or like Ecuador's near-historic win in Argentina on a June 2008 night that allowed a tie the very last second of the game in stoppage time. Today is a sad day in sports, folks. Let's carry on with everyday duties. That's right, the "z" is to get people's attention because that's what this US Olympic team deserves. From Jamie Trecker's lukewarm, although generally positive overview of the game to Ives Galarcep's excitement with the realization the potential of this squad, to an impressed Spanish-speaking media liking the team's chances, the US Olympic team's 2-2 tie versus Holland in the second game of group play was nothing short of spectacular although with a sobering end. Granted, I was only able to watch 60% of the game due to DVR malfunction, I saw enough to be happy with the style of play and the lack of stage fright and lack of respect for their foe (yes, I said it). It's important for these youngsters to realize that, as Trecker put it, this isn't the famed clockwork orange that trounced World Cup finalists Italy and France. This was another U-23 team just like them. As I like to say to people when I discuss soccer comptetitions: when it's not the full national team playing all bets are off. That is why Nigeria won the Olympic tournament in Atlanta and why Mexico's U-17 won that tournament. Back to the Americans: Flashes of glory from the Freddy Adu we all had such high hopes for back in 2003, Altidore's opportunistic brilliance, Kljestan's masterful play, Bradley's presence, Holden's quick moves, Parkhurst's steadiness, Wynne's pace, all came together in a spectacular performance. I was, thankfully, able to catch some of the highlights online even though youtube isn't allowed to broadcast. This, I feel, is one of the most important results for the national team to date. 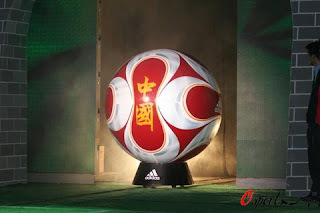 Here they have laid the groundwork for an appearance in the quarterfinals and a chance for glory on the olympic podium. It's close to what they did in 2002 when they reached the quarterfinals. Now only Nigeria remains in the horizon. This Wednesday morning at 5AM ET the game will be broadcast on USA network of the Olympic soccer HD channel if you have that. DVRs are a plus but make sure you set it correctly and allow for overtime, etc. We will be missing Bradley and Adu, the engines of our midfield, but Nigeria will be missing key defenders as well. It's time for Kljestan to show just how good he is and why he belongs in Europe. Feilhaber has a shot at redemption in what is a likely start for him. Szetela is another player to watch in place of Bradley. To me this game is like US-Mexico in 2002. So much is at stake and so much is to gain. A tie or a win sends the US to quarterfinals. Losing is not good enough unless Holland fails to win against Japan. Enjoy and succumb to your superstitions. Amidst constant squabbling between clubs and national sides and FIFA's position being overturned by outside forces (Sports oversight committee), I bring you a new installment of MLS attendance statistics. Hopefully Messi will be able to play with Argentina and we can have a tournament for the ages. Given that, MLS goes on and attendance numbers are beginning to lean to the positive end for more and more teams as the Becks circus visits town. DCU's faithful still show up in strong numbers (18K) and TFC enjoys the usual full house. Chicago also saw a full house with "el emperador" Claudio Suarez facing off against Blanco. The Fire's numbers have enjoyed a nice upswing this season with constant numbers and a 500+ difference from the end of last season. Adding McBride to the mix at the end of the month will keep the numbers up. This week's emphasis will once again be a look at the medians. 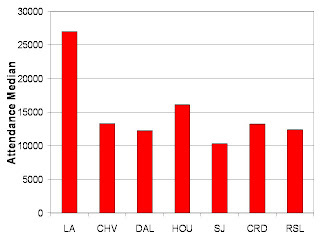 This time I created a plot that compares Median vs Average for the Western conference. I'm also adding the general median numbers for both conferences in high definition (just click for a full page view) to put everything in perspective. As always, general numbers are constantly updated every week and are on the right column... just scroll and enjoy!